In movies and on television, in greeting cards and advertisements, we are regaled with depictions of a love that thrives on attachment, longing, sentiment, and romanticism. 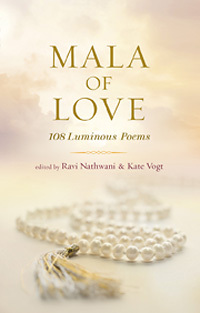 Mala of Love: 108 Luminous Poems is a collection of sacred poetry that allows readers to reach beyond this more commercial understanding of love and guides them toward realization of a more mystical love that is grounded in acceptance, joy, patience, compassion, and gratitude. We hope you’ll enjoy this article in which Mala of Love coeditor Kate Vogt shares lessons she learned while working on the book. We hope you’ll enjoy this short video in which Linda Graham, author of Bouncing Back, talks about how we can rewire our brains for maximum resilience and well-being. We also invite you to be a part of our upcoming Awareness Series Telesummit, in which Linda will be teaching a class called Shift Happens: How to Bounce Back from Disappointment, Difficulty, and Even Disaster. Registration is free and grants you access to 10 teleclasses that are being offered by top teachers of mindful living. Each class will offer practical strategies for turning down the overwhelm meter in your life so you can regain a sense of purpose, power, and peace. Zen teacher Karen Maezen Miller is known for helping her readers and students understand that the contentment they think of as “out there” is actually here and now. We hope you’ll enjoy this guest post by Karen, which is based on her book Hand Wash Cold. We also invite you to be part of our upcoming Awareness Series Telesummit, in which Karen will be teaching a class called “10 Tips for a Mindful Home.” Registration is free and grants you access to 10 teleclasses that are being offered by top teachers of mindful living. Each class will offer practical strategies for turning down the overwhelm meter in your life so you can regain a sense of purpose, power, and peace. With the pace of life accelerating, in a world of change, it’s not easy to maintain our balance and sense of direction. Yet we strive to do so, because a sense of direction, toward a meaningful goal, may be the better part of happiness. In this pursuit, the journey may indeed matter more than the destination — but without a destination to aim for there is no journey; we can only wander. We humans are goal seekers from infancy, drawn by the objects of our desire. But somewhere along the way, most often in the dilemmas and angst of adolescence, a sense of confusion obscures the simple desires of childhood. What we want is muddied by expectations about what we (or others) think we should do. We begin to doubt our desires, mistrust our motives, and wonder where we’re going and why. We hope you'll enjoy this short video, in which Eckhart Tolle, author of The Power of Now exposes the roots of imbalance and suffering, pointing to a life of mastery where we dwell in the dimensions of "being" and "becoming". We also invite you to subscribe to New World Library's YouTube Channel for immediate access to the latest author interviews, book trailers, and more. Most women today juggle multiple demands on their time: full-time jobs, meal planning, fitness, spirituality, shopping, dinner parties, soccer for Jenny, and t-ball for Johnny. Their lives are so full of commitments that many don’t ever find time to focus on their own dreams and desires. When bestselling author Jennifer Louden created an intuitive planner for herself and later shared it with others through her workshops, the results and achievements were so amazing that she turned it into a book — The Life Organizer: A Woman’s Guide to a Mindful Year — so she could share her system with others. We hope you’ll enjoy this guest post by Jennifer, in which she shares practical tools that can help make 2016 your most mindful year yet. We also invite you to be part of our upcoming Awareness Series Telesummit, in which Jennifer will be teaching a class called “Being Enough: Write Your Way to Fulfillment.” Registration is free and grants you access to ten teleclasses taught by top teachers of awareness and mindful living that will help you turn down the overwhelm meter and regain your purpose, peace, and power.